Demonstrate the recent development of personal skills relevant to the professional roles of the teacher. 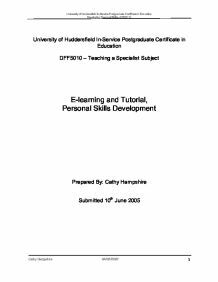 University of Huddersfield In-Service Postgraduate Certificate in Education DFF5010 - Teaching a Specialist Subject E-learning and Tutorial, Personal Skills Development Prepared By: Cathy Hampshire Submitted 10th June 2005 1. Abstract This report demonstrates the recent development of personal skills relevant to the professional roles of the teacher. There are two main areas to the report the first part describes the personal skills development of e-learning materials and how using Information Learning Technology (ILT) is aimed can address issues such as inclusive practice and differentiation. The second area of the report demonstrates the development of my role as personal tutor providing pastoral care to a group of second year AVCE ICT students, it is felt that an examination of the tutorial's role in teaching and learning would be a beneficial subject area for the secondary section of this assignment. 2. Table of Contents 1. Abstract 2 2. Table of Contents 3 3. Terms of Reference 4 4. Professional Practice and Assessment Error! Bookmark not defined. 4.1 Introduction 5 4.2 Curriculum Development incorporating Information Learning Technology 6 2.2.2 The e-learning continuum 7 2.3 E-learning tools and technologies 7 2.3.1 VLE/MLE Error! Bookmark not defined. 2.3.4 Interactive whiteboard Error! Bookmark not defined. 2.5 Conclusion Error! Bookmark not defined. 4.3 Reflective Analysis of 12 hours teaching Error! Bookmark not defined. 4.3.1 Lesson Evaluation 1 13 5. References 14 Appendix A Blackboard Handouts 15 Appendix B Individual Learning Plan of Student A 16 Appendix C Learning Materials 17 Appendix D Observation Reports 18 Appendix E PowerPoint Presentations 19 Appendix F Leeds Progression Module 20 Appendix G Assignments 21 Appendix H Edexcel Unit Specification 22 Appendix I Marked Assignments 23 Appendix J Assignment Tracking Sheet 24 3. ...read more. Part of my personal skills development was to learn how to use the new system in order to allow students access to course timetables, course specifications, course materials, assessments, collaborative learning in the form of discussion groups, synchronous and asynchronous communications and other activities. The VLE /MLE "provide easy to use e-learning platforms" [Littlejohn 03]. It allowed me to create and upload learning materials onto college Intranets, which can then be accessed by tutors and learners. The application also facilitates communication via e-mail, video conferencing, bulletin boards, and Instant Messaging Service (IMS). 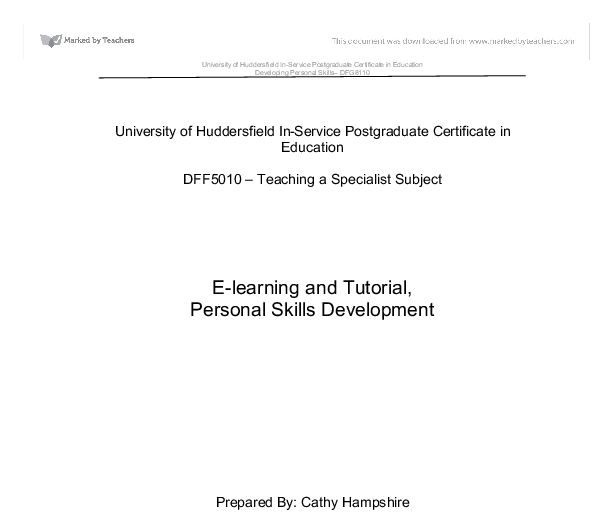 The personal development has concentrated around such areas as HND curriculum mapping, delivery of learning resources, tutor support and communication via for example e-mails and discussion boards and through assessment such as self-tests where responses can be tracked and progress monitored. Research undertaken at Durham University shows that the trend in adoption by academics has increased from 81% in 2001 to 93% in 2002 with staff stating it was either excellent or very good [Newland 03]. The students also benefit from using Blackboard with 88% saying they would recommend it for all their modules. The Newman report also stated that the Universities of Huddersfield and Paisley implemented nearly identical strategies at the same time as the University of Durham and had similar results with the uptake of their VLE's. Other tools I learnt to use as part of my personal development within the e-learning environment include, interactive whiteboard and projectors, these support conventional teaching interaction, being specifically designed to complement traditional teaching practices. [Grieffenhagen 00] believes that "interactive whiteboards might enhance the collaboration and interaction within the classroom". ...read more. of a clear objective, the failure of tutor or students to prepare adequate material or the failure of a tutor to comprehend the basis of student difficulties in other subject areas to a tutor's specialism. To counter this, care must be taken to ensure that there has been adequate preparation so that the tutorial session is not viewed as an opportunity for the student group to evade accepted learning strategies. There is sometimes resistance from students at higher educational levels towards attending tutorial sessions as they can view them as either of no benefit (they have 'already learned enough from other sessions') or an irritant (they have no concerns to raise, or if they have are not inclined to do so, believing nothing will be done anyway). These reservations can only be dispelled over time, and are entirely dependent on the abilities of the tutor concerned. Benefits of tutorials In my experience tutorials can provide an excellent opportunity to establish a rapport with a student group, improving communication and acting as a valuable support to student learning. They can allow confidential aspects to be discussed which as a personal tutor (my tutor group are mainly 17 years old in their first year away from school), it is within my remit that I deal with student's issues wherever possible, or at the very least direct them towards a course of action which will provide a solution to their problems (in some cases this has included personal ones). This addressing of individual concerns is in my opinion the most important facet of tutorial time, however this will undoubtedly vary from one tutorial group to another. 4.3.1 Lesson Evaluation 1 5. ...read more. When I observed him in play school he was fine and did not get jealous once. In fact he joined in with the other children and shared with them as well. Jack's mum has had a new baby girl and this has made Jack's jealousy worse as he seeks more attention from his mum. Active experimentation - testing implications of concepts in new situation (doing) There are eighty of the learning style questionnaire, through this questionnaire helped me pinpoint my learning preferences so that I am a better position to select learning experiences that suit my life. and bad points the link is: http://www.uni.edu/playground/report/blank_report.html, which I used because it is an actual link to rate your playground. ? - yes it was suitable YES NO SUPERVISION 1. Adults present when children are on equipment ? 2. Children can be easily viewed when on equipment ? For my secondary research I looked at books and the internet to find out as much as I could on creative play. I found out; what creative play is?, the role of creative play, the milestones involved in creative play and health and safety of creative activities. Discuss the nature-nurture debate in relation to individual development. dog, this is because the first child is bossier and wants to take on the role of the parent. Example of nature for intellectual development An example of nature in intellectual development would be, a child at a playground creates his own game and likes to play on his own, and this is natural as the child automatically does it.